Eye of newt, and toe of frog, Wool of bat, and tongue of dog, Adder's fork, and blind-worm's sting, Lizard's leg, and owlet's wing, For a charm of powerful trouble, Like a hell-broth boil and bubble. Double, double toil and trouble; Fire burn, and caldron bubble. My tongue will tell the anger of my heart, Or else my heart, concealing it, will break. And rather than it shall, I will be free Even to the uttermost, as I please, in words. Let us not burden our remembrance with a heaviness that's gone. How do I love thee? Let me count the ways. I love thee to the depth and breadth and height. My soul can reach, when feeling out of sight For the ends of being and ideal grace. I love thee to the level of every day's, Most quiet need, by sun and candle-light. I love thee freely, as men strive for right. I love thee purely, as they turn from praise. I love thee with the passion put to use, In my old griefs, and with my childhood's faith. I love thee with a love I seemed to lose, With my lost saints. I love thee with the breath, Smiles, tears, of all my life; and, if God choose, I shall but love thee better after death. My tongue will tell the anger of my heart, or else my heart concealing it will break. New Updates! (4/21/2019) We've been working really hard on completing our membership system so you can submit quotes and keep track of them. Once this is complete in the coming weeks there will be a lot more quotes by William Shakespeare and other authors. We've also changed the sorting on the site so you now see the latest William Shakespeare quotes first. 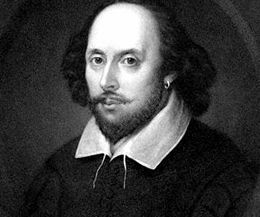 Our goal is to have the best William Shakespeare quotes on the web!